Don’t cross the streams: Mark Twain messing around in Nikola Tesla’s laboratory in 1894. Twain’s fascination with technology lead him to engage in many amazing conversations with the physicist-engineer. The literature and writing covering Tesla’s work (from the oscillator, the lightbulb, and the alternating current), much like the rest of science, wouldn’t be the same without an English-driven nature of science. During the summer after my freshman year, I was given the wonderful opportunity to study plant biology at the Boyce Thompson Institute for Plant Research at Cornell University. To my surprise, I ended up working in a lab with entirely Chinese scientists. Most of them casually communicated in their native language with each other. Apart from awkward lab lunches and some difficulties communicating about the research, it wasn’t a big issue for me. (Of course, some of my mentor’s programming notes were, to my disadvantage, written in Chinese). But I realized how much of a struggle it is for non-English speakers to become scientists. Though my family is from India, I had the luxury of growing up multilingually (in a household that spoke English, Hindi, and Arabic), but for the aspiring researcher in Costa Rica, Saudi Arabia, or Malaysia, the English-driven, or Anglophone, world of science is a struggle. Granted, the history of science has had a love-hate relationship with multilingualism. In 1869, Dmitri Mendeleev published the periodic table in Russian, but, because it wasn’t in German, it was difficult for the knowledge of this discovery to reach almost other places in Europe (such as Germany and France). Science used to be the language of polyglots; books, theories, data and all other forms of research were communicated in French, Latin, German, and other languages. But, in the advent of the World Wars, lingual international fervor took a hit, says Michael D. Gordin, historian of modern science at Princeton. Some advocated “unifying” languages like Esperanto, but, through the political turns of the 20th-century (namely the World Wars and Cold War), English emerged as the dominator of science. And the Anglophone majority persists today, whether or not you’re at a research conference in Berlin or a meeting in Tokyo. Though it takes a lot of effort to maintain English on such a large scale of science today, it’s efficient among English-speakers in Western and Eastern nations alike. If you know English, you can communicate with pretty much any scientist. We can disseminate information more quickly and with greater accuracy if everyone shares a common language. But there are drawbacks; for one thing, the monoglot nature of science creates a language barrier for anyone to enter the field. It’s one thing for someone to struggle with mathematics because he or she doesn’t understand differential equations, but what if someone couldn’t become a physicist just because he or she didn’t speak English? 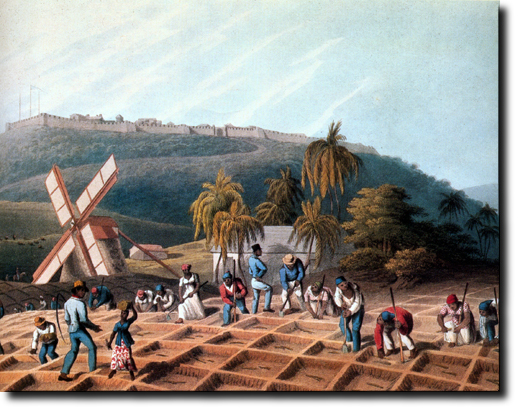 A sugar cane plantation in the West Indies in the early 19th century. The agriculture, botany, geology, economic geography, and other scientific endeavors were central to British Imperialism, according to John MacKenzie, Professor of Imperial History at the University of Lancaster. The Anglophonia of science might be the bullet that non-English speakers have to bite. If you don’t publish in English, it’s very unlikely that your work will be noticed. We’ve evaluated the efficiency of multilingualism in science at the individual level. We’ve come to accept that the individual must do whatever it takes for him or her to become a scientist, rather than making reforms and changes to the entirety of science. Unfortunately, the language of science has been decided by the grand scheme of politics throughout history. From this, we end up with a system in which, if English is the norm, then individual scientists have to learn English or perish. Some might make the argument that, by approaching the scientific topics and issues in different languages, we expose ourselves to different cognitive processes that help us understand science better. But there isn’t so much support for the idea that different languages influence cognitive processes (ie., Whorf hypothesis, linguistic relativity, etc.) so much as there is evidence that English barriers block others from entering science. Studying organic chemistry in Spanish might not “exercise your brain” much more than doing the same in English. Galileo thought that the nature is written in the language of mathematics, but it seems ridiculous to argue that nature is written in any human language or combination thereof. Similarly, it’s hard to imagine that science could be guided by whether or not we choose to speak Swahili or German. Besides, it’s not so clear whether or not science could afford to take the time and resources to embrace different languages in the current state of science. Though the current burden lies on individual non-English speakers, it would be an even greater burden for journals, labs, and entire organizations to reproduce, translate, and think through results in multiple languages. While my Mathematics professor from Japan struggles to pronounce certain English letters, we can pretty much understand what he says. Especially at the globally-minded universalist nature of the university, we can ease the barriers to entry for most people. Next Post How Much Do We Know About the Brain?